From Classic and Sports Car - "BOOK OF THE MONTH - CANDIDATE FOR BOOK OF THE YEAR"
From Motorbooks - "Probably one of the most significant motoring books to be published in recent years and a particularly lavish production." 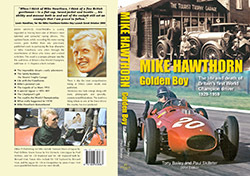 The above is what they said about the original 2008 Mike Hawthorn Golden Boy, now sold out after two editions. Maybe I'm biased because Mike Hawthorn was very kind to my dad when he was a young man but I'd place this firmly in my all-time top ten of motoring books. 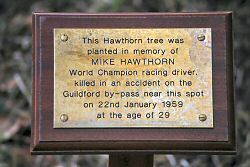 Yes there had been biographies of Hawthorn before - Challenge Me The Race, Champion Year, Mon Ami Mate - but this is unique in its presentation with outstanding use of images and ephemera; something not often found in driver biogs. The plentiful illustration makes it easy to dip into; and it helps the very in-depth analysis of the infamous crash that caused Mike s death. The original hardback is long out of print; and a smaller-format softback was issued in 2014; but the hardback is always to be preferred because it really benefits from its much larger size and better paper quality. Now we have the updated and revised 2014 Softback Edition! With 280+ pages, it contains much of the original book plus important updates and new photos. 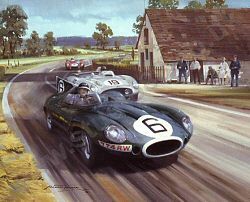 One update is a vindication of Mike in the 1955 Le Mans accident from a long lost letter to Jaguar Cars from an expert eyewitness. Plus we have new testimony on the 1959 accident that killed Mike from a policeman who still had his original police pocket book that was filled in at the time. You can order it from Paul Skilleter Books now - it costs £29.95 inc post (UK only and is a special offer), Overseas extra. 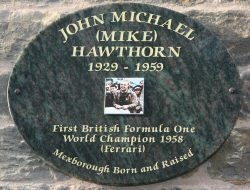 There is now a Mike Hawthorn Museum, built and maintained by one very devoted fan - read all about it! 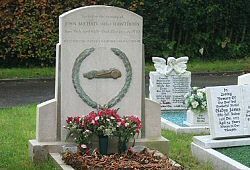 A warm 2019 welcome from the Web's most visited and comprehensive tribute / information site for 1958 World motor racing Champion John Michael (Mike) Hawthorn (not Hawthorne) or 'The Farnham Flyer' as he was often known. We sincerely hope that you find your time here is a useful and pleasant experience - we currently have 92 web pages of information for you to browse. This currently equates to over 900 printed A4 pages! Note that all material shown here is copyright and not to be used elsewhere. Now into our tenth year, the site has been a great success, becoming No 1 in the major search engines when looking for Mike Hawthorn. We've had lots of good responses from visitors that you can read a selection of. 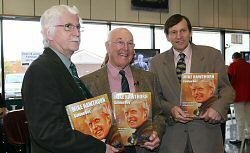 In 2008, the success of this site initiated the production of the best-selling book 'Mike Hawthorn Golden Boy', the first edition of which sold out inside a few months. Many visitors helped in its production for which we thank them. We have to thank everyone who helped us achieve this along with all those who purchased the book, now out of print, and gave it such kind comments, both press and personal. While looking around, you may find you have information that would be useful to others if seen here - if so please Contact Us - as many, many people already have - with your information and we'll do our best to add it to the site at some future date. You'll find that the 92 pages here include information on many of the marques that Mike drove such as Ferrari, Jaguar, Vanwall, BRM etc and there are many images of these marques. There is also a list of all the cars he drove in his career. Plus details of cars he owned such as his Alfa Romeo 8C and Ferrari 212, Lancia Aurelia and later his Jaguar XK140 DHC and Jaguar Mk 1 saloon. Did you know Mike was a pilot and flew his own Aircraft? 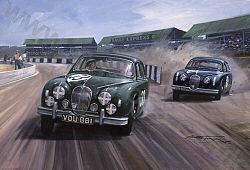 Young and very talented West Country artist Paul Dove, who painted the cover image for the Mike Hawthorn Golden Boy book, has created a number of new Mike-related artworks. 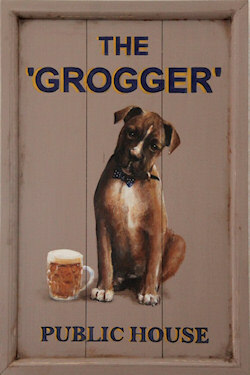 These include several 'Pub signs' that 'might' have existed at some time past. These were on show at Race Retro in 2009 although all were sold very early on the first day! We have a dedicated page for Paul Dove with some background and examples of his Hawthorn work so please have a look and support Paul if you are looking for something. We have done our best to try and establish that all images and videos shown here are either very likely in the public domain or that we have established the copyright owner (where this is possible) and/ or have permission to reproduce them from our many contributors, especially other Hawthorn fans. We are also using Google Earth © where this is useful - such as in pinpointing where the fatal 1959 crash occurred. We have a large section on Mike's Tourist Trophy Garage that was located in East Street, Farnham - the basic structure is still all there but with a different facade! If you have any memories and especially any images of it back in the '50s and later please contact us. If you want to make a virtual visit to Mike's grave, please do so to remember him. If anyone went to the actual location on the day, we'd be pleased to share your images here. We have a page for Mike's Grave and show you via Google Earth where it is located if you wanted to visit it as many do. It is regularly maintained and generally carries fresh flowers. We have a comprehensive two-part report covering the events on the day of Mike's death - if you can add anything to it, do please let us know via our Contact page. We are updating the site as time allows so please do return to check out changes. We were particularly pleased to receive a nice thank you in our early days from well known Author and motorsport guru, Doug Nye, himself an expert on Mike, via the Nostalgia Forum on the Atlas F1 Bulletin Board. A very well attended memorial service was held for Mike Hawthorn on Sunday 25th January 2009 at St Andrews Church in Farnham, close to the 50th Anniversary of his death. It was a big success with over 500 people at the church, 5000 people in the streets of Farnham and coverage by major media. Stirling Moss, Damon Hill (seen above at the service), Tony Brooks and other celebrities attended, drove some of the 70 1950s cars afterwards, and laid wreaths privately at his graveside. You can find more details and a full report on our Memorial Service page. The BBC also have a news page for the event. 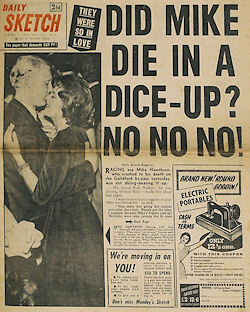 January 22nd 2009 was the 50th Anniversary of Mike's death on the A3. Fans worldwide remembered him around midday and gathered by his grave in West Street, Farnham. You can read much more about his death on this site. You can Register with us! This came from suggestions by people using the site (and there are a lot more visits than we expected!) - you can access some larger images after logging on and we also have extra member-only facilities and articles. We have much already-known and even more NEW unique material on the site - with lots more given us by Mike's fans who have contacted us since we first went live back in 2006. Many are from Farnham where his home was - including people who worked at Mike's Tourist Trophy Garage with him back in the 1950s. We look at Mike's life from start to its tragic end and try to cover everything on the way. We have an extensive Memorabilia section, including Model cars. Then there are images from 1950 through 1959 and a special section on Paintings of Mike. Plus all his career Race Results - and a lot more, 92 pages currently! There are links to other sites and articles on subjects such as recreations of his Jaguar Mk 1, registration VDU 881, that he sadly died in on the 22nd January 1959 after a major crash plus info on the recreated cars that have been built. We look at his life and death, the funeral and grave, plus memorials in detail and also analyse the disaster at Le Mans in 1955.  We have a full Site Map to help you find your way around. 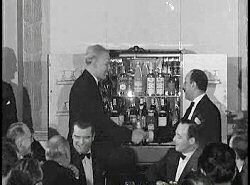 The above photo shows Mike enjoying himself with Jack Hawkins and others - he is receiving a cocktail cabinet presented to him at the Cafe Royal, London, from the National Sporting Club in January 1959. This was only 60 hours before he died. The question is - does anyone know what happened to the Cocktail Cabinet? Did it ever arrive at Mike's home or did the National Sporting Club retain it - or does someone out there own it now? Please use our Enquiries page if you know the answer! You can see the preview news video this still came from at our British Pathe Archive link. There is also coverage of his death there. In January 2008 and again in 2009 as World Champion, British Formula 1 driver Lewis Hamilton was presented with the coveted Hawthorn Memorial Trophy at the Motor Sports Association's Night of Champions at the Royal Automobile Club, Pall Mall in London. It was first presented in memory of Mike Hawthorn who sadly died a few months after his great 1958 victory, 1958 being the 50th Anniversary year. 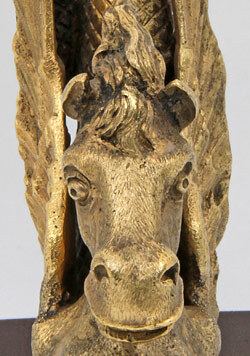 Did you know there was a second original version of this trophy? 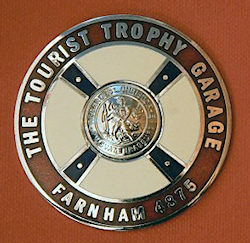 We need any photos of the Tourist Trophy Garage in East Street Farnham, especially views of the complete forecourt as it was anytime between 1953 and 1959, and any interior views of the workshop and facilities. See our TT Garage page for those we already have. Were you a customer during Mike's tenure maybe or did you even work there? Again, let us know if so - five former TT Garage employees have contacted us so far as a result of seeing this site! June 2009: This 1:43 model of VDU 881 has been released by SMTS and is distributed (exclusively?) by Grand Prix Legends - we have an example. 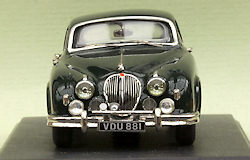 However, first impressions are very poor with the model having a distorted body shell and displaying many inaccuracies - including use of a Jaguar Mk 2 grill - that should never ever have got through to production. There is a discussion on this model with more photos on the Atlas F1 Nostalgia Forum. A Marble Plaque in memory of Mike was unveiled in his home town of Mexborough on Saturday 16th December 2006 at midday. A classic car display was part of the celebration and a crowd assembled at 11.30am with the plaque being placed on the side of the Intersport shop, at the corner of High Street and Hope Street, at noon. Read the full stories with Videos! "Being born in Yorkshire made him a cut above the others as shown in his determination to be the best in his field. Although he left Yorkshire as a small boy, he still remained a Yorkshireman at heart. And before he asked my father for my hand, he reminded him that he was a true-born Yorkshireman. So my father gave us permission to marry"
Lewis Hamilton World Champion by One Point 50 years after Mike won! 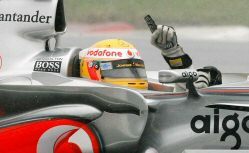 Congratulations to Lewis Hamilton for his fantastic Championship win! Like Mike Hawthorn back in 1958, 50 years ago, he took the title by one point, also becoming the youngest ever world champion. Lewis will also win the Hawthorn Memorial Trophy for the second year running. See our Book Launch page below for a personal greeting from Lewis and videos. Lewis was also kind enough to send a greetings message to the launch of the book on Mike written by the creator of this site with help from all its visitors. 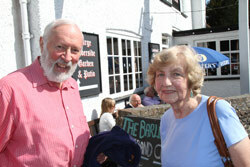 50th Anniversary Lunch at the Barley Mow! 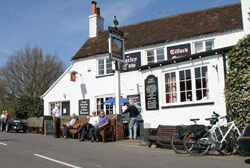 A celebration was held, 50 years to the day of Mike Hawthorn's World Championship win, on October 19th 2008 at the Barley Mow in Tilford, one of Mike's favourite pubs. We have lots of photos from the event. We met with ex Tourist Trophy Garage Fitter, Frank Swan - Frank worked there from 1950 - 1954 and has many memories and photos of that time. Read Frank's Story for more information. 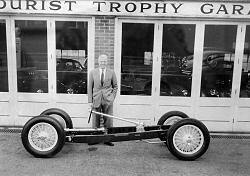 And we have a page all about the Tourist Trophy Garage Transporter that was used to move Mike's Cooper-Bristol around in the early 1950s. Our account of Mike's Funeral has been updated with a detailed report on the proceedings including a list of mourners plus new photographs from a former Tourist Trophy Garage employee who was there. Plus detail of Mike's Will and the value of his estate from the Probate document. 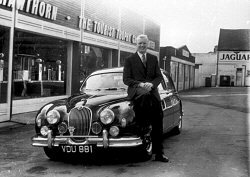 We also have an extract from Paul Skilleter's book about Norman Dewis, Jaguar's Chief Test Engineer, where Norman discusses what it was like working with Mike and other 50s drivers. We are looking for more information on this car since nothing surfaced during previous research for this site or the book Golden Boy nor does anyone who worked at the Tourist Trophy Garage at this time remember the car or any mention of it at all which is very unusual. The car currently has a different body to the 1950s Abbott DHC, apparently having been rebodied ca 1984 in an identical type to the Phil Hill 212 Barchetta so has no resemblance at all to the original Abbott bodied car anyway. We are collecting information for an article on this car. If anyone out there has any direct personal knowledge, written documentation or memories of this car (wonderfully described as the ugliest Ferrari ever built), either in chassis or Abbott bodied form, especially period photographs (with Mike would be great but anyone would do!) other than from the series of the one above and from the period involved (1951 - 1954), and that definitively links the chassis or car to either Leslie or Mike Hawthorn or the Tourist Trophy Garage in period (existing documentation does not), would they please Contact Us. Another piece info we have been given is that it could have appeared as a show car at the 1952 Earls Court Motor Show (Oct/Nov 1952), if so, it would have been in Abbott bodied form since 1971 correspondence from Abbott confirmed that they had finished it (and it was the only one they built) in September 1952. It does NOT state though who they had built it for. 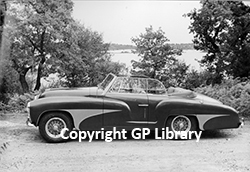 A search of the 1952 show catalogue does NOT appear to offer any trace of it - Ferrari did not exhibit and Abbot only displayed two Bentleys. 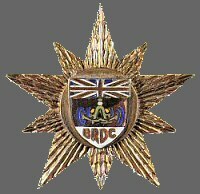 There are no other references that can confirm this - does anyone have docs or photos of it at Earls Court in 1952??. NEW EVENT Sunday 14th October 2018! FREE! 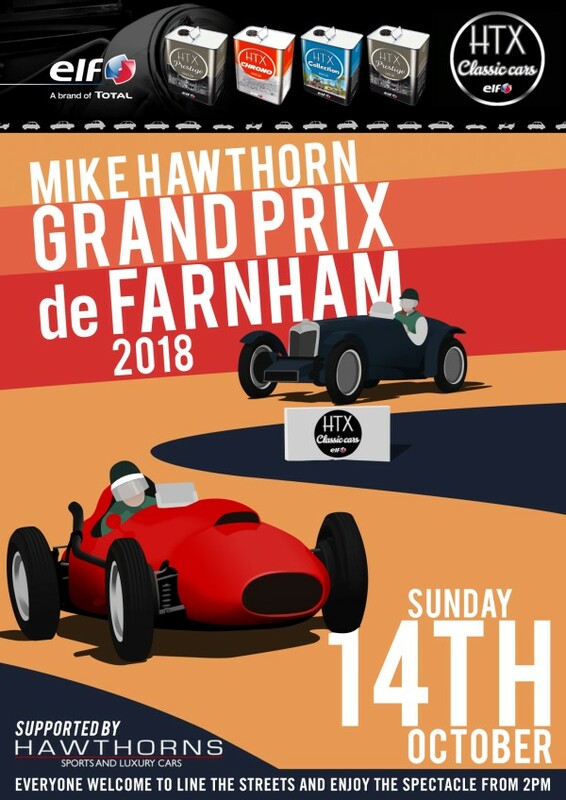 To mark the 60th anniversary of Mike Hawthorn becoming Britain’s first Formula One World Champion, the Total Elf HTX Mike Hawthorn Grand Prix of Farnham will take place on the streets of Farnham in Surrey on Sunday 14th October 2018. This is a very similar event to that held in 2009 at the Memorial Service for Mike in Farnham which is where the videos on the Event site are taken from. La Scuderia is the story of the men who shaped the championship seasons of 1957 and 1958 with tragic results. 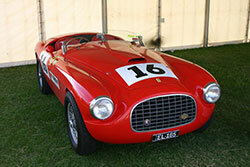 During the golden age of Ferrari, the Scuderia is regarded as the ultimate stable of thoroughbreds. 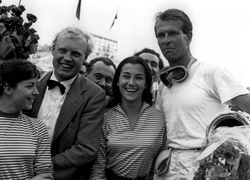 Its five leading members - Peter Collins, Mike Hawthorn, Luigi Musso, Eugenio Castelotti and the Marquis Alfonso de Portago - are the bravest and the best – the most accomplished collection of drivers that have ever been selected for a season. The skill of these drivers is matched only by their fearlessness. There is massive competition and mistrust on the asphalt; a careless mistake by a team mate can be disastrous but individually they don’t doubt their own ability to win. The cars are a death trap – one mistake and you don’t walk away! It’s a drive-hard, play-hard world and their excesses off the track are as renowned as their risk taking. 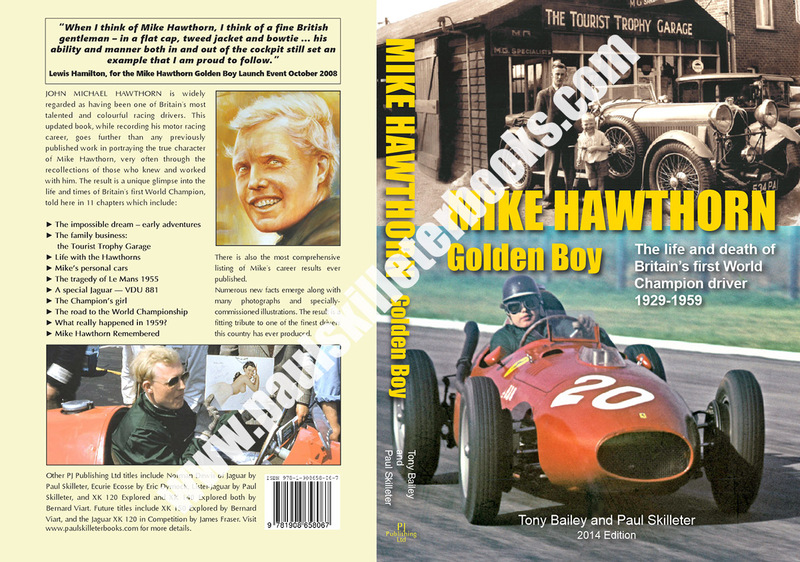 A new edition of our best-selling 'Mike Hawthorn - Golden Boy' book is now available as a 2014 Edition softback! It contains much of the major content from the original book plus new material bringing everyone up to date on what has happened since the launch of the 1st Edition in 2008. There is a scoop of a long-lost letter to Jaguar from a USAF witness that further clears Mike from any responsibility for the 1955 Le Mans crash, new evidence and photograph from a policemen who was first at the scene in 1959 when Mike died - and he still has his police notebook which is transcribed! Plus new colour photos of Mike's son Arnaud and the first ever interview with one of Mike's companions from 1955. FOUND! 1956 Standard 10 6/7cwt Delivery Van! We now have Standard (Ten) 6cwt Delivery Van to recreate the one the Tourist Trophy Garage used from 1956 onwards! It needed to be the early version that does NOT have the Pennant style (capped) headlamps. This will be undergoing a full restoration and signwritten to match the known Tourist Trophy Garage insignia on the original van. 'Hawthorn-related' Mk 1 sells for £44,000!! 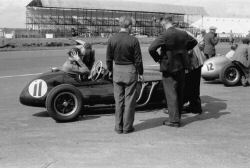 "Dating from the final year of production, this 3.4-litre Mk1 reputedly was ordered by the then reigning Formula 1 World Champion, Mike Hawthorn, who tragically met his death in a road traffic accident on 22nd January 1959 and never took delivery, though there is no documentary evidence of a Hawthorn connection. 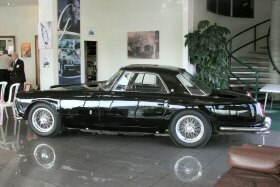 The car is said to have been ordered as a duplicate of Mike's first Jaguar Mk1, complete with various factory enhancements." This is the second car to have been put up for auction with unsubstantiated/ unproven claims of a connection with Mike in as many months - see the Ferrari Barchetta 212 details at the foot of the previous column. 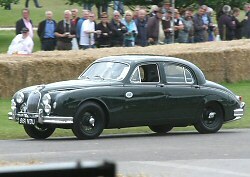 Jaguar Mk1 Day at the Mike Hawthorn Museum - 5th August 2012! This event, held on Sunday August 5th 2012 went off very well despite extreme weather in the morning. 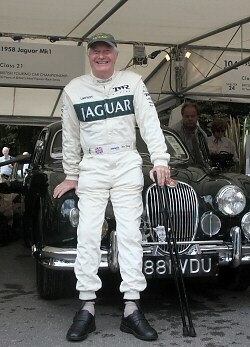 Mike Hawthorn - Proposed Feature Films! Over the past few months, there has been a sudden rash of proposed films about or strongly featuring Mike - we are aware of at least THREE Feature Films and one TV Documentary so far! All are 'in development' and there have already been several meetings and dialogues with one writer who is well advanced with a positive script that uses Golden Boy for material and we are offering our help. Some pretty high flying director/producer choices are also appearing. More to follow as it becomes available. 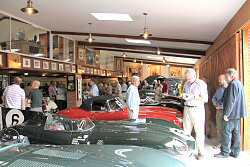 This private museum is the culmination of one man's devotion to his motorsport hero and was opened in 2009 and is dedicated to 1958 F1 Wolrd Champion Mike Hawthorn. It was created by fan Nigel Webb and you can read all about it HERE. It is private but the possibility of visits is explained on the page. There are also special events held which will be detailed here as they occur. The 15th April saw the first Annual Mike Hawthorn Celebration organised by Hawthorns of Farnham with a driving day for all vehicle enthusiasts and exclusive access to 2 private collections of over 50 rare cars and memorabilia, including a visit to the Mike Hawthorn Tribute Museum. All proceeds went towards building the Mike Hawthorn Sports Hall at Barfield School mentioned above. Contact Jonathan Sproule (see next item) for more details. Jonathan Sproule tells us that he is trying to raise a lot of money (£250,000) to help build a Mike Hawthorn Sports Hall at Barfield School where he has four children. This was Mike's first school and features in 'Golden Boy'. If you feel you can help with this, please contact him on 01252 733377 in Farnham at Hawthorn's Garage up near the railway station or via jonathan@hawthorns.co.uk. A reminder that there are two days at the Barley Mow in Tilford Green when Hawthorn enthusiasts and cars can come along and enjoy a chat and a pint plus food. Organised by Tim Ely and there is more info on last years events further down this column. 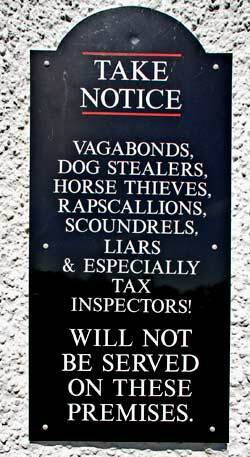 Note that the following visitors are NOT welcome! Mike's grave headstone in Farnham's West Street Cemetery is deteriorating after some 50 years and is in need of replacement. The suggestion is to create a new replica granite headstone that will last a lot longer. Estimated cost is ca £8,000. Donations from visitors to the Mike Hawthorn Museum will provide some of the cost but larger donations for the project are vitally needed. If you feel you can help, please make an enquiry via our Contact page and you will be passed on to the correct person. 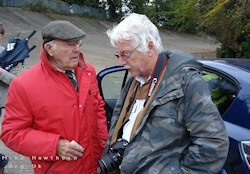 Sadly, ex TT Garage fitter Frank Swan has passed away. 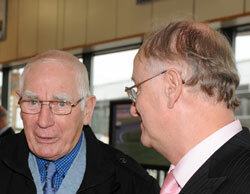 Frank helped us immensely with the Golden Boy book and had worked at the TT Garage from 1950-1954. His well-attended funeral was held at Aldershot Crematorium on Friday 28th October at 2:30pm. We have a page dedicated to Frank Swan. You can read the story all about Mike's fatal crash and events leading up to it in detail on this site. There is a lot more information and photographs in our Golden Boy book on Mike. 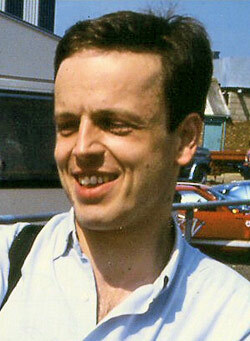 The above photo recently came into our possession - it shows Mike's illegitimate son - Arnaud Michael Delauney - and was taken at Silverstone in 1991 when he had come over with his Aunt, Louise, to meet up with Chris Nixon. The likeness is staggering and, when younger, he did have blonde hair. You can read more about Arnaud on this page. We have the full text of the original press release from back around 1993 and it is available here now. The film was never made of course – although there are more recent developments that might just materialise into something. Graham Orphan has contacted us from New Zealand to say "Did you know that Mike Hawthorn's Fairchild F-24W Argus aeroplane G-AJSG still exists? The aircraft was stored in a suburban garage in Healesville, Victoria, Australia for decades but after the passing of its owner, was sold to owners in New Zealand who did very little with it. 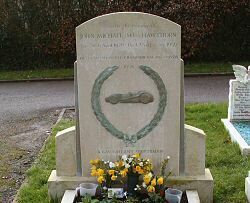 It has now changed hands again and it is planned to restore it as a flying tribute to Mike Hawthorn. An intended concession will be a colour scheme change from the dull silver it last wore in the UK to a BRG scheme. The aircraft is in good straight condition but needing new fabric and general refurbishment & reassembly." That is great news and we'll pass on any more info when we get it. CAA records do in fact show (see Golden Boy) that this plane was registered to Leslie Hawthorn in 1947, then cancelled and sold on to Australia in September 1954, soon after Leslie's death. Mike flew that plane and also had his own Argus that he flew after that. 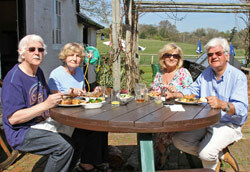 A glorious spring day welcomed visitors to the first of Tim Ely's two lunchtime gatherings at Mike Hawthorn's favourite pub near Farnham on Mike's birthday, 10th April 2011 The Barley Mow is set in a fabulous location at Tilford Green with food and drink plus lots of other Mike Hawthorn Enthusiasts. Nigel Webb's fantastic replica of Mike's Jaguar Mk1 VDU 881 was there plus Tim Ely's Riley Ulster Imp - Mike's very own first race car. Another visitor was Dorrie Mahoney, one of Mike's girfriends. Why not come to one of the October events celebrating Mike's Championship win? Due to a favourable review in Classic & Sports Car the demand for the badge/plaque that appears in the Golden Boy book and is affixed to the slip case of the leather bound edition went sky high, selling out the remaining stock in two days and several more batches have had to be ordered since! If you want one act now! Publisher Paul Skilleter has them in stock (along with the few remaining stocks of our Golden Boy book of course)! They are made from high quality enamel using two separate dies with a domed centre St Christopher and are 50mm diameter. 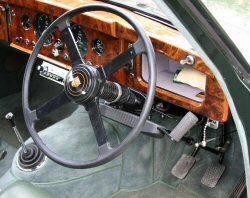 Designed by Mike Hawthorn in 1958, one would make a marvellous addition to any Jaguar saloon as well as your den or garage. 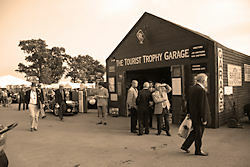 TT Garage built & featured at the Goodwood Revival! We were thrilled to be at the three-day 2009 Goodwood Revival where the event featured the usual traditional period garage, this time made out as a part facsimile of the original wooden 1935 Tourist Trophy Garage that was located not far from the later one in East Street, Farnham. Those involved with this site worked closely with Goodwood staff to ensure that the final result is what everyone would expect from a Goodwood period set! 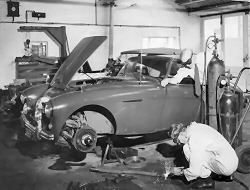 You can read all about it on our dedicated page with plenty of photos..
Mike stocked and sold the first two produced of these models, both made in RHD, from his Tourist Trophy Garage in 1958 and drove one himself. One of the cars still survives and is owned by Adrian Donovan in the UK. This info arrived too late to include the car in the Mike Hawthorn Golden Boy book but we have details here. 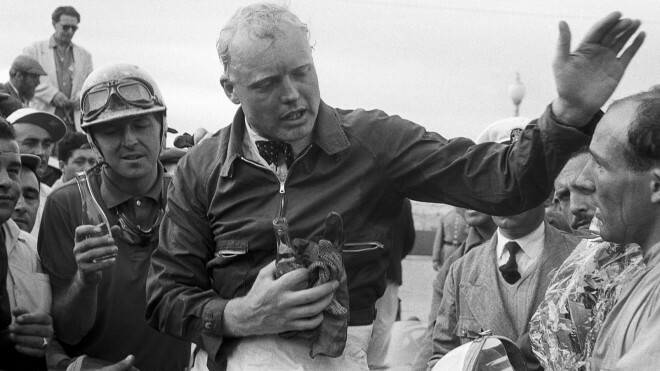 Mike Hawthorn was a keen home-movie guy and was often seen at events armed with, I think, a Bell and Howell 8mm camera. 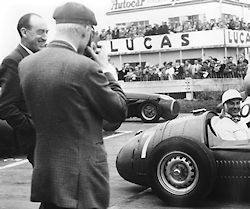 He's seen above, along with his trademark cap, filming Stirling Moss at Goodwood before the Glover Trophy in April 1955. But none of these films or the camera(s) seem to have survived! We know from an eye-witness that his mother burnt many of them in the back garden of his Farnham house after he died, along with lots of other historical material. 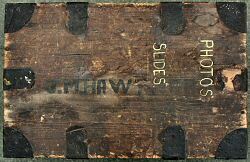 Do YOU know if any film survives somewhere? Please Contact Us if so. Book Launch on BBC TV! On November 20th 2008, the book that was inspired by this site and its fans and worldwide visitors was launched in Farnham, Surrey, Mike's hometown. A BBC News crew covered the event live via satellite and motorsport commentator Murray Walker was there with a message from Lewis Hamilton. You can see more including video coverage on the Book Launch home page. And on Monday 3rd November 2008 at 7.00pm, the BBC One UK show included a four minute item which payed tribute to Mike near the anniversary of his World Championship win date 50 years ago. 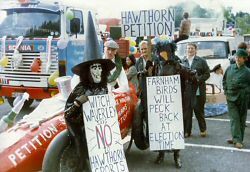 Sadly, back in 1981, a 7500+ signature petition failed to get the new Farnham Sports Centre named after Mike. See our archive photos and info on this event from the past.